Back any of the candidates to win the upcoming elections using our 2016 Presidential Predictions. It doesn’t matter if your colors are red of blue, what matters is that you go out there before November 8 and place a wager on the next president of the USA! Oh, and yeah, you can also vote for either of them if you believe we need more democracy/republicanism in the world. Check out our 2016 Presidential Predictions if you haven’t been following the comedy show between Trump and Hillary that makes Borat look like a five-year-old’s Saturday morning cartoon. Following the uncovered tape where Donald Trump boasts about his vulgar manoeuvre on an unnamed, married woman – “grab them by the p***y, you can do anything.” – all the major online sportsbook shifted their odds in favour of the Democrats winning the elections. Trump dismissed his crude comments as ‘locker-room banter,’ however the damage was already done, and many supporters are now shying away from him. We’re not saying Hillary is all that great – she’s got her own delusions – but when you have members of your own party turn against you, well then you probably won’t be heading for the Oval Office. Check out the best 2016 Presidential Predictions according to the biggest online sportsbooks below! In case you find yourself in America and you’d like to place a bet on one of the candidates, Bovada Sports offers you the chance to do just that. 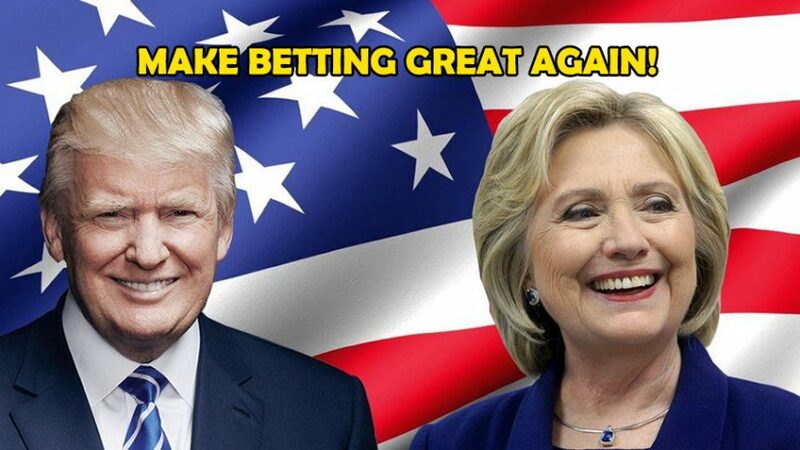 The online sportsbooks accepts US players, so you can place wager on any sports market, and of course the most important one – US presidential elections. Bet with Bovada Sports now! Like every other online sportsbook, Bet365 Sports is backing Hillary to win the elections, although the odds on her are slightly better here than they are on Bovada, while Trump’s chances are lower. (Tough luck if you’re an American and you can’t access Bet365; perhaps it’s time to leave the ‘land of the free’ so you can actually enjoy more betting freedom. Quite ironic, I know.) The great thing about Bet365 is that is offers a full range of betting options when it comes to the US elections, but make sure to consider our 2016 Presidential Predictions before placing a wager on any market. Unibet offers the best odds when it comes to Hillary, so it seems that she really is going to win the elections, which means that we’ll have better healthcare, better education and higher taxes because of the increase in quality of the first two items. But wait a minute! Why am I even concerned about this!? I’m not even American, I’m Yurpean, and we have countries with great laws here in Yurp that allows us to… wait till I remember… they allow us to… nevermind! We’ll get back to this later. The important thing is that you go through our 2016 Presidential Predictions and back any of the candidates before November 8! To be honest, before writing up the US Presidential Predictions, I didn’t even care about the US elections, since, once again, I’m a Yurpean. But when I read an article on the New York Times titled Trump and the Nuclear Keys that’s when it hit me that I should care more about this matter; if not for the sake of American politics, then at least for my own personal safety. I think we can all agree that as good as Trump is at making business calls – he is after all worth $3.7 billion – I would not trust that man with a microwave code, let alone nuclear codes. A man that’s as trigger happy when it comes to firing people, should not – no, correction – must not become the next US president, and be given nuclear codes which he may regard – in his mind – as harmless codes for him to beat his opponents while playing Battleship. So, please Americans, let us not parish from a nuclear war and vote for Hillary instead. But before that check out our 2016 Presidential Predictions and bet on any one of the candidates – except the lewd businessman that lies like an 11-year-old, brags about his (failed) conquests like a junior at college and has a brain capacity lower than that of prehistoric men.